Dr. Adesola (“Sola”) Kazeem Adeduntan is the Managing Director/CEO of First Bank of Nigeria Limited and Subsidiaries from January 1 2016. Prior to this appointment, he was Executive Director and Chief Financial Officer for the Bank since 2014 when he was appointed to the Board of the Bank. Before joining FirstBank in 2014, Sola was a Director and the pioneer Chief Financial Officer/Business Manager of Africa Finance Corporation (AFC). 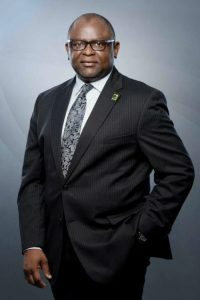 He has served as a Senior Vice-President & Chief Financial Officer at Citibank Nigeria Limited, a Senior Manager in the Financial Services Group of KPMG Professional Services and a Manager at Arthur Andersen Nigeria. Sola also had a brief stint at the defunct Afribank Nigeria Plc (now acquired by Skye Bank) as a graduate trainee where he worked mainly in banking operations. He has attended executive/leadership programmes at Harvard, Cambridge, Oxford and INSEAD. Sola is a Director of Africa Finance Corporation (AFC), Nigeria Interbank Settlement System PLC (NIBSS) and FMDQ OTC Securities Exchange as well as a member of Sigma Educational Foundation, which is focused on enhancing the quality of tertiary education system in Nigeria. He is a Fellow of the Institute of Chartered Accountants of Nigeria. He is happily married with children and loves music especially Africa folktale music.